Have you tried creating a watercolor effect on a scrapbook page or a card lately? For some reason when people say “watercolor” I get all nervous – like only highly trained artists can create a fun watercolor effect. I am also very guilty of purchasing all kinds of fancy things with the word watercolor on them in hopes that they might some day turn me into a watercolor artists! LOL! Okay I just solidified to you all that I am slightly crazy! When Kelly Klapstein filmed this webshow with us a few months back I was excited! 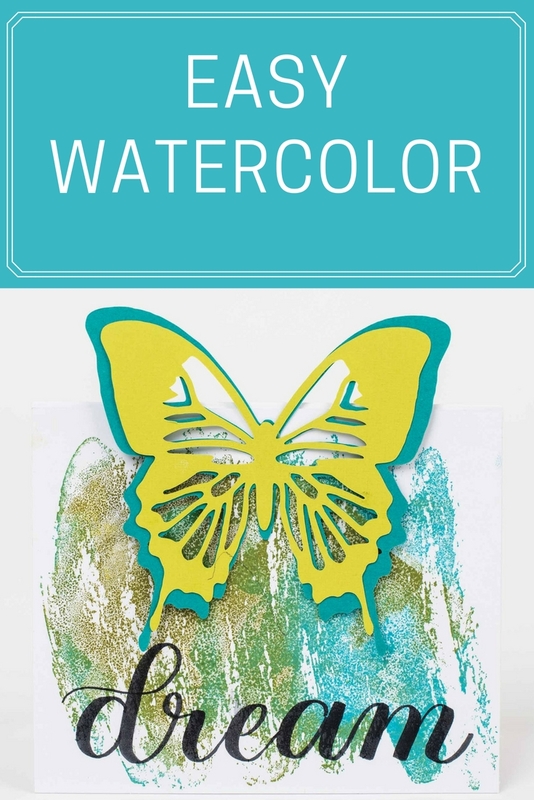 Easy watercolor effect is only a STAMP away!!! YAHOOO! Pair that up with ink, the Brother ScanNCut and some Tombow Dual Brush pens and voila! You got yourself an EASY, ANYONE can re-create card! I love it. Supplies: Brother ScanNCut electronic cutting machine, Stampin’ Up! ink and stamps, Tombow Dual Brush pens and adhesive. The base of the card is Creative Scrapbooker Super Stock. A heavy weight cardstock that can absorb a lot of different mediums without warping. Stampin’ Up! is famous for producing high quality stamps in trendy cutting edge themes. This watercolor stamps is no exception. Flawless background everytime. The next thing on my need to learn list – is hand lettering. Kelly created the title “dream” using Tombow Dual Brush pens. Everything on the card was also stuck down using Tombow adhesives. Watch as Kelly walks you through each step of creating this beautiful card. Be sure to follow Creative Scrapbooker Magazine on YouTube – we have literally hundreds of videos waiting to spark your creative fire! Thanks for watching – have a super wonderful Sunday everyone!